Dr. Rachel combined a life-long interest in science and medicine with her love for animals. She developed an interest in alternative modalities while attending the University of Minnesota College of Veterinary Medicine. 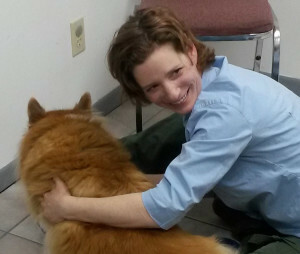 She started acupuncture training not long after graduating and achieved certification in animal acupuncture through the International Veterinary Acupuncture Society in 2004. Her training and interests naturally progressed to animal chiropractic and she obtained training and certification in Veterinary Spinal Manipulative Therapy at the Healing Oasis Wellness Center in 2006 and is also credentialed through the American Veterinary Chiropractic Association. She completed training in Applied Kinesiology at Health Pioneers in 2013. Dr. Rachel is continuously amazed at the power of modulating energy to affect healing. Acupuncture and spinal manipulation are the best treatment options she has found to improve the health of the neurologic system, thereby improving the health of the whole animal. Dr. Rachel is well-known for her empathy and rapport with clients and patients, and is occasionally referred to as “Magic Hands.” Additionally, she continues to develop her interests in nutrition and herbal therapies.